Start your career with Sanjay Commerce Classes now!!.. In this competitive world, if you are looking to start your journey in the commerce stream, then we are at your doorstep. Sanjay commerce Classes being the best 11th commerce coaching in Jaipur is available for the brilliant students providing them the finest of their services. Commerce being the base of 11th Class Students, will be honored to widen their expertise in accountancy and economics thus nurturing them in strengthening their competence and to apply their skills for a better future. Mission:- “Good results, Quality standards”. Apart from this, students will be helped to apply their practical skills on other books too (books written by other authors, the one which is not followed by school). The students are preparing in a way that they won’t get stuck in cracking their board exams. we provide extra attention in setting up their goals for Board Examinations. We work on the objective of building a better career at our institute. Separate sessions are taken for low scoring students.So, why to wait when we are at your doorstep. We just book your seats and build your wonderful career with Sanjay Commerce Classes. 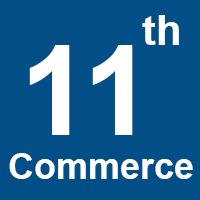 Click Here to know more about 11th commerce classes.